CRAZY DISCOUNT! Was: $539.95 Now: $349.96! The GIANTZ 65CC 9 IN 1 Gardening Multi-Tool is the answer for those who are looking to do some serious work in the garden, whilst doing it as easy and efficiently as possible. The pole chainsaw comes with 3 extra thick alloy extension shafts which allows you to reach up to 5.3 metres for those areas you could not reach before! Featuring a powerful 62CC 2-stroke engine with an E-start recoil pull system, a lightweight design, a flexible gear joint which allows blades to adjust in a range of up to 90 degrees, a comfortable and convenient D-handle, and quick connect coupling for easy change of attachments; the GIANTZ 65CC 9 IN 1 Gardening Multi-Tool is designed to make those difficult tasks easy. 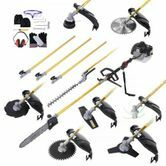 This powerful multi-tool set will make any gardening work simple and effortless. Was easier than I thought it would be to put together. Although instructions and diagrams could of been better.